We Hope You Have An Electric Christmas! 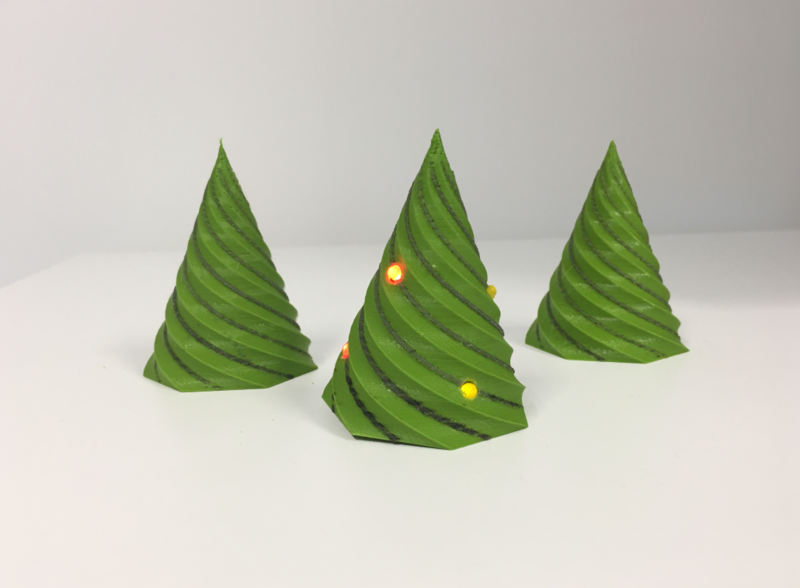 To celebrate a fantastic year (and for a bit of Christmas fun), we decided to demonstrate the benefits of conductive ink and how this could be integrated with 3D printed polymers. Conductive ink can be used to remove the need for wires in electronic assemblies, which can help reduce weight; cost of production; and reduce assembly time. Our simple Christmas tree illustrates how power from a 3V battery can be connected to a series of LEDs to achieve a consistent and reliable connection. Throughout 2018, we will be working on an exciting InnovateUK funded project in collaboration with the University of Warwick; Printed Electronics Ltd; and C Enterprise (UK) Ltd, makers of the CEL Robox. The 18 month research project will focus on combining deposition of polymer based materials with electrically conductive inks; replacing the need for wires to be used in complex electro-mechanical product assemblies. The design team at ITERATE are seeking to engage with product manufacturers and end-users who could take advantage of this new additive manufacturing process. The technology will provide distinct benefits to products that incorporate plastics and electronics across sectors such as: medical, automotive, aerospace, consumer Internet of Things (IoT) and industrial IoT. http://iterate-uk.com/wp-content/uploads/2017/12/Merry-Christmas-3DPrinted-Conductive-Ink-Snipped-Twisted-Cropped.png 2778 3780 Gethin Roberts http://iterate-uk.com/wp-content/uploads/2019/01/Website-Logo-2019-Sized.png Gethin Roberts2017-12-14 15:22:522017-12-14 17:03:37We Hope You Have An Electric Christmas!